If you've ever fancied building a website to showcase your own music or that of your band's, now could be an opportune time to act. Why? Because software developer Image-Line is currently running a music website creation contest that could see you winning up to $1000. If you want to enter, you need to build your website using Image-Line's EZGenerator software. The full version of this costs $129/€99, but the good news is that you can complete your site using the freely downloadable demo. EZGenerator is designed to be used by people who have no previous web development experience. 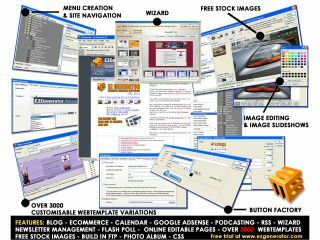 It comes with over 3000 web templates and enables you to add features such as MP3/video playback and blogs. There's even an e-commerce module. The winner of the contest will walk away with $1000, while there are also second, third and fourth prizes of $500, $250 and $100. The closing date for entries - which can be stored on Image-Line's server or your own - is 31 December. You can find all the details on the EZGenerator Website Building contest page.